Funeral services for Vernon Leroy Spence, 96, West Plains, Missouri, will be held at 10:00 a.m., Saturday, February 9, 2019 at Dry Creek General Baptist Church, under the direction of Robertson-Drago Funeral Home. Mr. Spence passed away at 12:20 p.m., Tuesday, February 5, 2019 at his home. He was born July 14, 1922, in the Dry Creek Community, to Ira W. Spence and Rhilda Camilla Wood Spence. On February 13, 1943, he was married at San Luis Obispo California, to Fern W. Webb, who preceded him in death on December 2, 2013. Mr. Spence was a veteran, having served with the United States Army during WWII. He was awarded four bronze stars for campaigns in Central Europe, Rhineland, Southern France and Rome-Arno; he also received buttons and lapels for European African-Middle East Theatre and four overseas bars. He was a farmer and enjoyed his family friends and farm work. Mr. Spence was a member of Dry Creek General Baptist Church. He is survived by two daughters, Donna Romans, Kansas City, Missouri and Bonnie Bryan and husband, Ronnie, Pomona, Missouri; three grandchildren, Kelley Thompson and husband, Doug, Aaron Bryan and wife, Christa and Amber Kristek and husband, Chris; nine great-grandchildren, Emily, Spencer and Pierce Thompson, Kindall, Kamrynn, Kristian and Karrington Kristek and Aiden and Tyson Bryan; two brothers, George Bryan Spence, West Plains and Jim Spence and wife, Darlene, Salina, Kansas; one sister-in-law, Betty Lee Spence, Willow Springs, Missouri; special friends, Betty Good, Springfield, Missouri and Van Turner, Willow Springs, Missouri; three caregivers, Janella Schafer, Donna Rhoads and Mary Russell and husband, Terry; and several nieces and nephews. His parents, wife, and two brothers, Clement and Willowby Spence, preceded him in death. 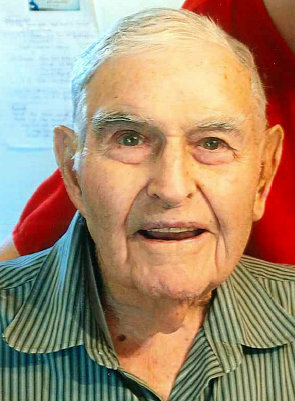 Mr. Spence will lie in state from 5:00 until 9:00 p.m., Friday, at Robertson-Drago Funeral Home. Burial will be in the Dry Creek Cemetery. Memorial contributions may be made to Alzheimer’s Association or OMC Cancer Treatment Center and may be left at Robertson-Drago Funeral Home. One of the kindest, sweetest, and wisest human beings ever who was a great neighbor and friend. Such a dear! Holding friends and families in my heart and sending love. Keeping you and your family in our prayers and thoughts. Sorry for your loss Bonnie and Donna. Very wonder man, and always spoke to me when out and about. Lived a good life. Sorry to all the family for your loss and prayers for you. Vernon seemed to always have a smile. He will be missed. Donna and Bonnie- Such treasures you had with both your dad and mother (Fernon and Vern, as I said when I was young). I always picture your dad with that ever-present smile and eyes twinkling with true care and compassion for family and friends. What a comfort to know he is in the presence of the Lord and reunited with your mom—don’t you know she softly asked what took him so long? was a great husband, father, grandfather and friend. They are together again. May your memories bring you comfort.